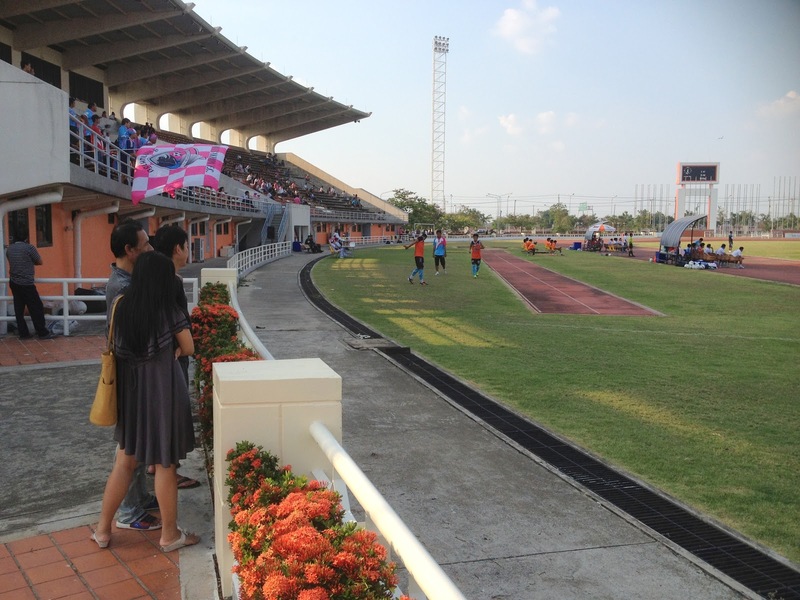 Thai Honda FC is a professional football club based in the Minburi district of the Thai capital of Bangkok. 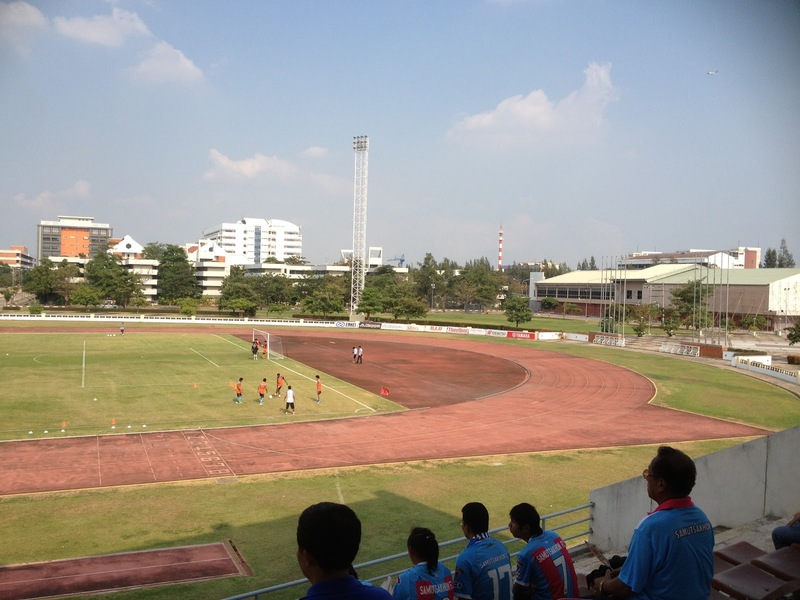 The club was formed in 2000 as Thai Honda Ladkrabang FC playing regional football before being accepted into the second tier Thai Division 1 League for the 2004-05 season. 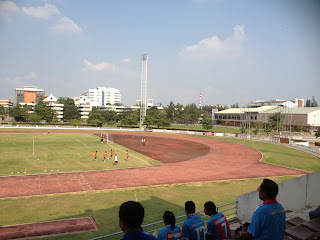 A runners-up position gained promotion to the Thai Premier League for 2006, where they finished in eleventh position with Coulibaly Cheick Ismael top scoring. 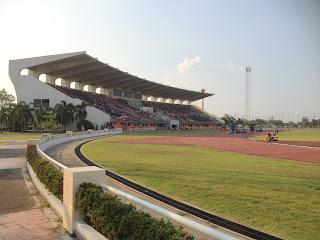 A move to the 72nd Anniversary Stadium in Minburi followed for the 2007 campaign. The goals of Ismail Faday Kamara weren't enough to save 'The Speed Kings' from relegation. Things could have got worse in 2008 when they finished in the League 1 Division relegation spots. However, Bangkok Bank withdrew from the competition so all four relegated sides played off to retain their second tier status. 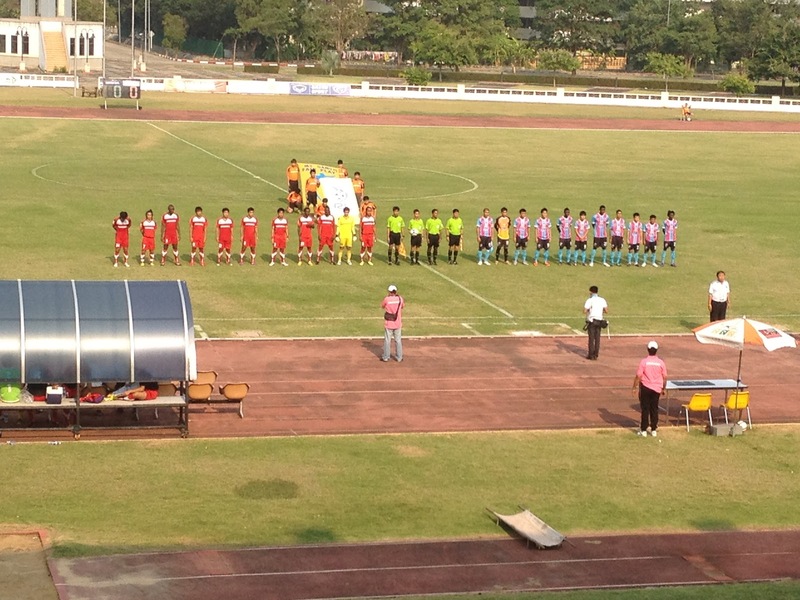 Honda defeated Raj Vithi and then Nakhon Sawan to stay up. The goals of Sutin Anukoon led the side to eleventh place in 2009. The club moved to King Mongkut's Institute of Technology (KMITL) Stadium near to Suvernabhumi Airport for the 2010 season, with the team finishing in eighth place as Nana Yaw Asamoah top scored for the team. 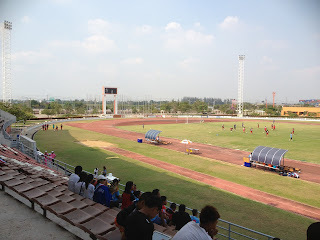 In 2011 Honda were back at Minburi for a disastrous season in which the team finished bottom of the table and were relegated to the third tier Regional League 2 Bangkok Metropolitan Region. In 2012 Thai Honda won their divisional title while playing at KMITL Stadium to qualify for the Champions League play-offs where dreams of promotion ended in the group stage. This was followed up with fifth place in 2013. 2014 saw Honda lift the league title once again. The team won Group B of the Champions League to secure promotion back to the second level as Rodoljub Paunović banged in the goals. Gastón González topped the charts in 2015 as Honda consolidated their status. 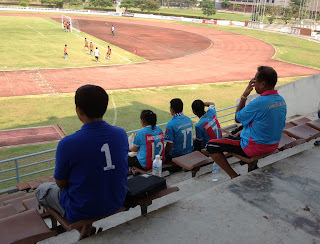 Ricardo Jesus fired Thai Honda Ladkrabang to the Division 1 League title in 2016 to send the club back to the top flight while playing back at the 72nd Anniversary Stadium. 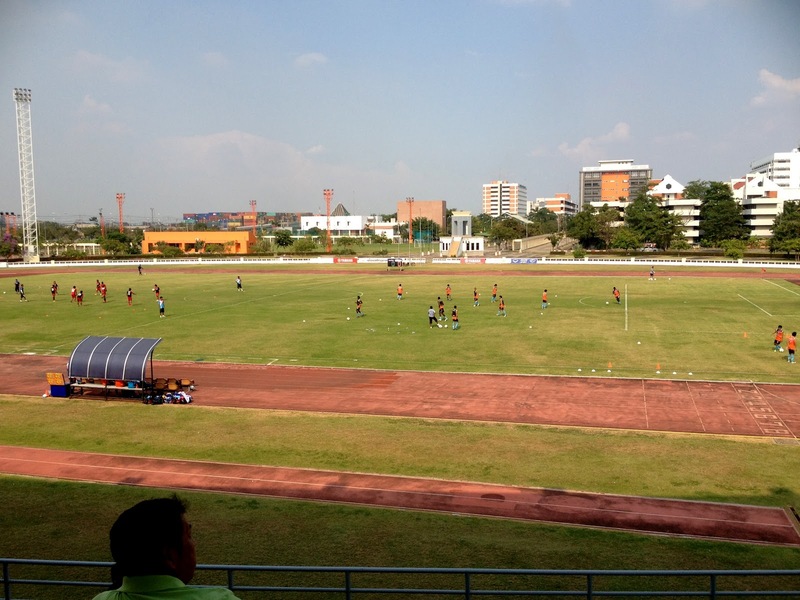 Thai league football was restructured for the 2017 season, with the top division being called Thai League 1 (T1). Honda's promotion led to BEC Tero-Sasana looking for a new home. 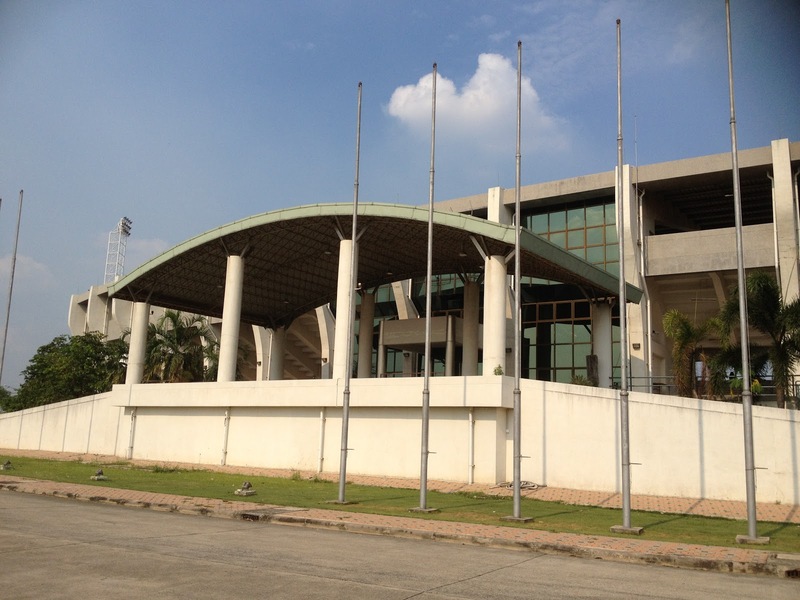 A ruling didn't permit groundsharing between team in the highest division. Honda secured the stadium to stay in Minburi, while Tero moved to merge with Police and play in Lak Si. 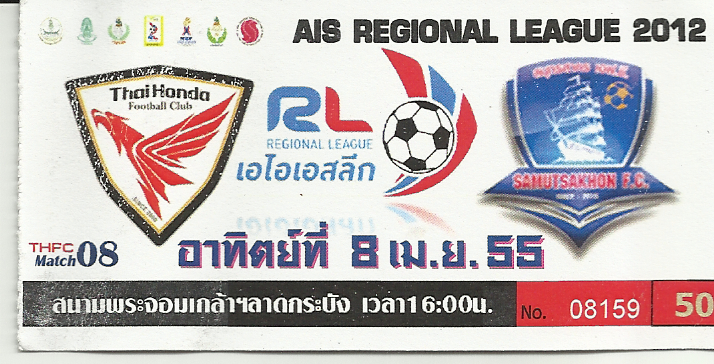 Ironically, Honda's spell at the top table lasted just one season before they were relegated to Thai League 2, where they finished in twelfth place in 2018 as Tawin Butsombat ended as top scorer. 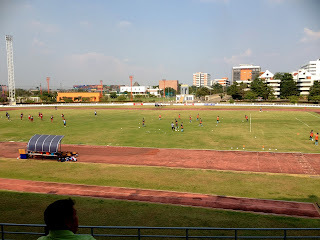 Thai Honda FC will compete in the Thai League 2 (T2) in the 2019 season. It was the final day of one of my best ever holidays in the Land of Smiles. I had just arrived back from Chiang Mai after a wonderful and joyous International Cricket Sixes Tournament by plane with Steve and Fah. I was to meet them later that evening for my goodbye mookata meal, but in the meantime I said my goodbyes and headed for my budget hotel. I was in a quandary as to which game to select. There were choices of two 4pm kick offs, but I knew I wanted to catch the majority of Bangkok United's 6pm game in Ding Daeng close to the city centre. In the end I plumped for Thai Honda's home game after I was given helpful advice from the guys at both http://www.thaileaguefootball.com/ and http://www.thai-fussball.com/ via their Twitter accounts. 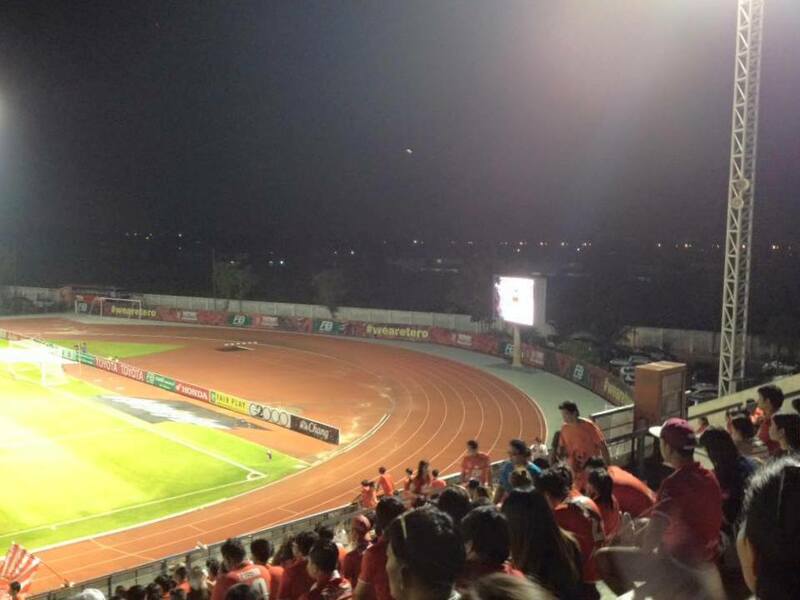 They confirmed the venue to be the KMITL (Technology) Stadium, which I'd passed on the motorway many times when heading to Pattaya. It was in the Lad Krabang district, which bordered Suvarnabhumi Airport. I reasoned that it would be easy to make a quick getaway to get into the city meaning I would miss a minimum of action. One beauty of Bangkok is that you never have to wait long for a taxi, wherever you are. Whether the driver has a clue where he's going is another matter altogether as I was about to find out! I saw virtually all of the city by taxi within four hours! Anyway, even though my hotel was well up a lane away from traffic, a taxi soon appeared. I had planned well in advance and printed out a map of where I wanted to go. The driver still seemed confused until suddenly the penny dropped. 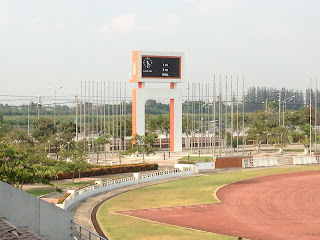 If I'd have asked for the King Mongkut's Institute of Technology rather than the stadium he'd have sussed it a lot quicker, but I didn't realise it was on the campus. We still seemed to go an agonisingly long way round, but the city's traffic system has baffled more experienced tourists than me many times before. The main thing was that he knew the way. We were waved through the gates of the Institute and drove round the large campus, which even had its own 7/11 shop; another guaranteed feature in the city along with taxis. He dropped me behind the towering Main Stand. As at every game I'd attended in Thailand, a small stall had been set up by a vendor selling drinks of all kinds, crisps, noodles and local delicacies that were cooked on a small griddle. I was glad to get some water. I was determined to keep my alcohol content down as I'd had enough to sink a battleship over the previous ten days. It was officially the second day of mourning for the late Princess who'd passed away six months earlier. Her funeral parade was to be the next day. I happened to see this on live TV as I was awaiting my call to board my plane at the airport. In terms of pageantry, the Thais did it well as anyone. 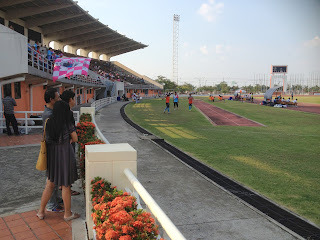 I went up to the desk and paid 50 baht for admission to the stand. 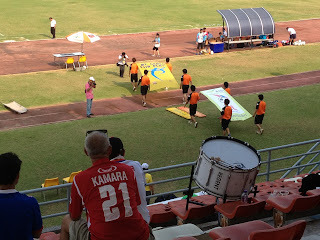 I was surprised at the absence of any souvenir stand, especially as some home fans were wearing replica kits. I went up the stairs to survey the scene. The KMITL Stadium was extremely lop sided. The stand I was in was the only proper spectator accommodation. It was an absolute beauty of a cantilever structure raised above the pitch and following the contour of the field, which had a running track around it. The rest of the pitch was surrounded by a prim hedge. Fans could stand there and watch for free, although I'm sure that it wasn't encouraged. 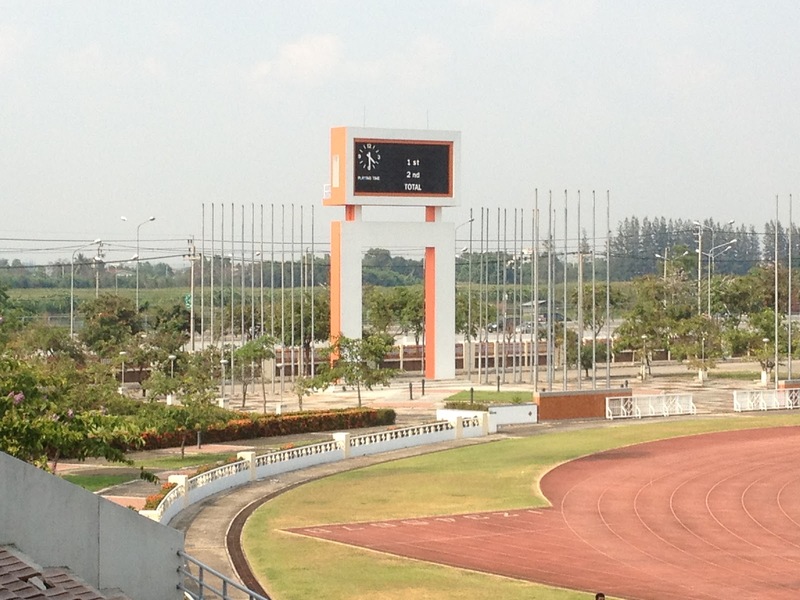 A large scoreboard stood at the Motorway End but the rest of the area spread out to wide expanses of the Institute's sports facilities. 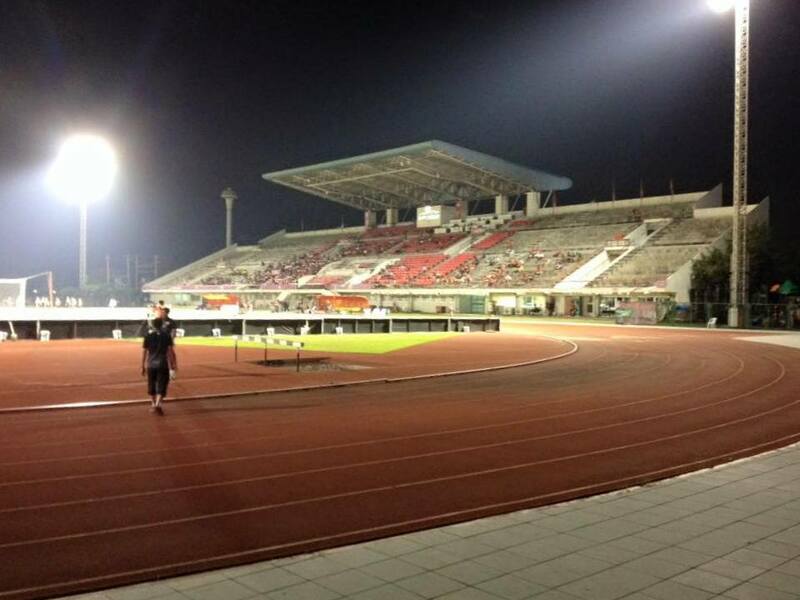 The crowd was sparse, with more away fans than Honda's and definitely more watching than the official figure. I'd have put it at around 3 to 400. 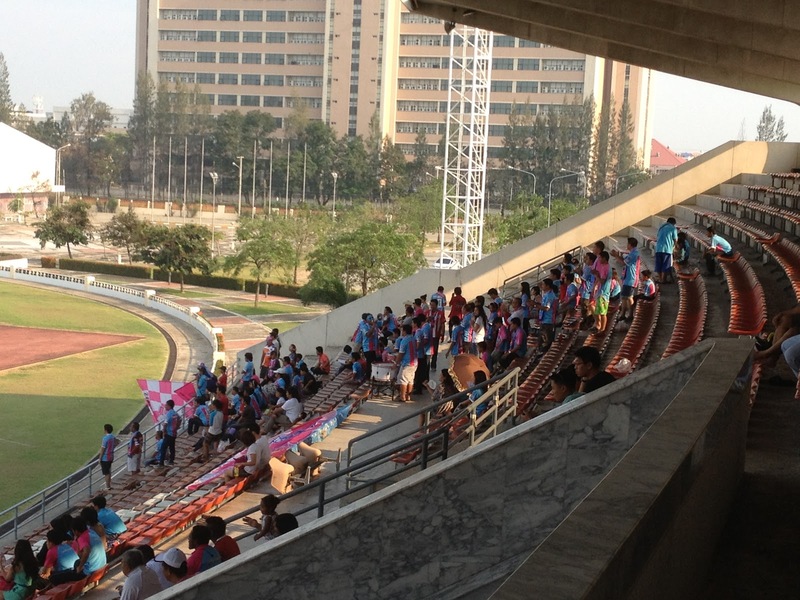 The Samut Sakon supporters wore their eye catching pink and sky blue striped shirts. Both sets of fans who sat at either end of the stand had drums and hooters to try and create an atmosphere. One of the vocal Honda fans offered me a warm smile and welcome. I'd seen them a couple of years previously in their local derby at the team now called Customs United (Suvarnabhumi Customs at the time). Maybe he recognised me as I don't suppose they get a lot of ferangs (westerners) following them? The teams came out with flag bearers at the front and stood to attention for a minute's silence, which I presumed was for the Princess. The royal family are extremely revered in Thailand so it was no surprise that you could have heard a pin drop during the period of reflection. There was a lady sat in the same block as me who was as pretty as any fan I'd ever come across at a match. If she required consoling I would have definitely put my name down to offer my shoulder. The game itself was pretty poor if truth be told. 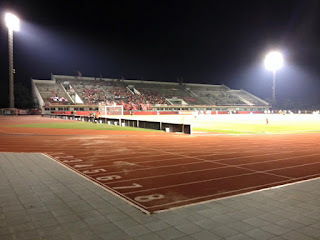 It was scrappy and lacking pace, which was little surprise as they were playing in at least thirty degree temperatures. I was having another bottle of water and some interesting sausage meat type delicacy on a stick, which was seasons with chilli's and onion. They were tasty and a great help to my dietary plan for the following twenty four hours! I was getting restless. 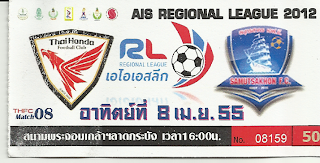 I reckoned I'd chosen the wrong game and my thoughts were on sneaking off at half time to maybe catch some of R-BEC's game in Lat Phrao on the way to the Thai-Japanese Stadium for my evening fixture. Both teams at my current game were struggling to put any real moves together or test out the goalkeepers. Just before half time I decided to make a move. I walked behind the goal to take some photos and went on my way with the game goalless. I left the Institute by the back entrance and crossed the railway lines and a khlong (small canal) to try and get a taxi to take me to Lat Phrao. This was not an easy task as most drivers just shook their heads until I walked to main road at the end of the soi I was on. I'm glad I visited a lovely stadium, but had wished for a better game. I later found out that the visitors solitary goal was enough to take them to the top of the league. I could have found a lot worse activities on a Sunday afternoon! 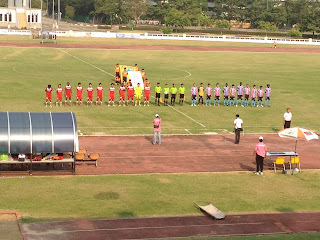 Click here to see a short home video of the game.